I am feeling quite a bit better today--other than a killer headache and some residual nausea, the side effects from the Bactrim are finally going down. Yesterday was another rough day--feeling super nauseous, bad headache, and zero energy. For those of you concerned I may have a kidney infection, I wasn't running a fever and my urinalysis was totally normal, so I'm 99% sure that I was sick from the Bactrim. Also, after all this happened, I remembered taking it before and having a similar reaction--nothing as severe, but I felt sick for a couple of days. I am never going to take it again! My August was very uneventful, so my 1 Second Everyday video is probably my most boring one yet. 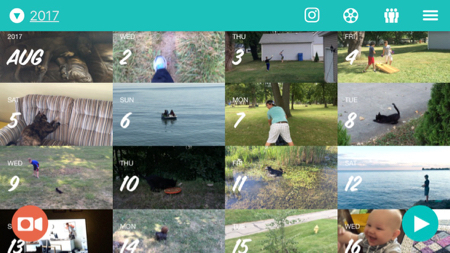 But I still love this project, and not every day is going to be a party ;) The app just looks like a calendar, and then you tap on each day to choose the clip you want to use. Yesterday was the last day of the month, so I spent the morning calculating how we did with our budget for the month. As nerdy as it is, I actually get really excited to do this stuff! Fridays are fun because it's payday, and I also do our grocery shopping for the week; but the last day of the month is my favorite, because I use our extra money that we saved that month to pay down our debt. This month, we had several extra expenses--things like car registration renewal ($224, which sounds crazy); the kids' back-to-school supplies, clothes, and shoes; a birthday gift for my mom and a shower gift for Lance; and some other stuff. Oh, and I included Jerry's fantasy football in that, too, rather than having him use his "allowance". He worked 90 hours last week!! (He chose to; he didn't have to.) If spending $170 on fantasy football makes him happy, then it's money well-spent. Anyway, after paying our bills and our extra expenses for the month, we were left with $977.50 to pay onto the credit card debt. Not bad! We only have two cards--just before we started the budget, I consolidated the cards I had down to two, and each has 0% interest for another year. The first card had a balance of $3157.75 when we started our budget in June. After yesterday's payment, the balance is down to $589.50--so we should be able to pay it off entirely next month! Card #2 started with a balance of $7660.70 in June. Per the snowball method, we're just paying the minimum payment until card #1 is paid; then we'll apply everything to card #2. I'm guessing we'll have it paid off in about six months. Then we'll work on paying off the Jeep; and finally, the house. If all goes well, everything should be paid off in 3-4 years. I'm amazed at how much better this way of budgeting has worked for us. We had tried so many times to follow a budget before, but because our weekly income varies so much, we never made it more than a week or two. And we were living paycheck-to-paycheck, which was super stressful. Now, using the zero-sum budget (which I explained in the post I linked to above), we don't worry about having enough money to pay the bills; and, each of us even has an "allowance"--cash that we can spend however we'd like. I've been looking at the budget as a sort of game, and it's actually really fun! (Yes, nerdy; but I'm a nerd, so it works.) Today, being Friday, was grocery-shopping day. On Thursday evenings, I go to Kroger's website to load digital coupons to my Kroger card. They add new coupons about once a week, so I always check on Thursday nights. Then I look at the weekly ad to see what's going to be on sale. I love when I can combine the sale items with the digital coupons. Something my mom taught me when I was young, and that I found to be very good advice, is that coupons only save you money if you use them on things you were going to buy anyway. In other words, I shouldn't buy things just because I have a coupon; but if I was going to buy Lucky Charms, for example (my favorite breakfast right now), and I can get a coupon, then that's great! I'm saving money. After I load the coupons on my card and check out the weekly ad, I write a simple dinner menu for the week, and I try to include the items that are on sale or that I have a coupon for. Then I make a list of the groceries we need for the dinner menu, as well as other items we need for breakfasts, lunches, snacks, and household items--toilet paper, dish soap, etc. Obviously, I don't go into lots of detail--if I keep it simple, I'll actually do it. And on Friday morning, I go to the grocery store. I always stick to my list, which I'm sure has saved us a ton of money. I used to go without a list and just buy whatever sounded good or was on sale. By using a list, I know that everything I buy will be used in some way that week, because I've planned it out ahead of time. Today was a big shopping day, because I had to get the stuff for the kids' school lunches in addition to the usual stuff. The total before sales and coupons were applied was $218. Then after using my Kroger card, the total went down to $143! I got some really good deals today--my Neutrogena body wash, regularly $6.79, was on sale for $5.79. I had loaded a digital coupon for $3 off, making it $2.79. Then, because of another promotion, I got another dollar off. So, I bought my body wash (something I needed to buy anyway) for $1.79! Another example is the Nature Valley granola bars that Jerry likes. They are regularly $3.99, and were on sale for $2.79. With the special promotion, they went down to $1.79. And then I had added a digital coupon for $1.00 off, so I got them for just 79 cents! Finally, by shopping on Fridays, I get double the fuel points (100 fuel points = $0.10 off per gallon of gas). Last month, I earned enough to get $1.00 off per gallon--which really adds up when filling up the tank. So, our budget starts fresh for September today. Since there are five Fridays (paydays) in September, we have planned to take the fifth paycheck and set it aside for next month. Jerry and I are going to Portland in October, and since he won't be working that week, his paycheck will be very low. To avoid getting behind, we're going to use the fifth paycheck from September to cover it, and then we won't have to worry about it. Someone asked me after I previously posted about this budget how we got the money to actually start the zero-sum budget. Because you are using the current month's income to pay for next month, you need to front the money for a full month when you start--which is difficult! 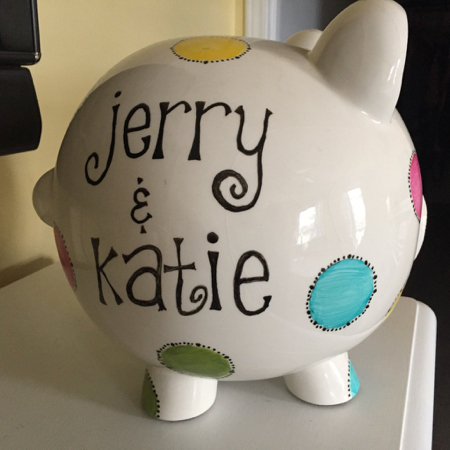 We were very lucky that we started our budget when we did, because it was an unusually high income month for us--there were five Fridays, Jerry worked a lot of overtime, and I had written a sponsored post. So, we ended up with just enough to start the zero-sum budget. The fifth payday each month (if you are paid weekly) is something I've found to be a painless way to save up some money. Since most months have just four Fridays, we are used to living with four paychecks per month. If there is an extra payday, it would work out nicely to just set aside that whole paycheck; and when there is enough money to start the zero-sum budget (basically, you just need your "bare-bones" amount to start). Once you have the money to start the budget, it's very easy to keep going from there! I had totally forgotten about this until someone shared it on the From Fat to Finish Line Facebook page today! I was interviewed for an Oprah.com article, and it is now up on the site. You can find it here: Secrets to Keeping Weight Off. You have such cute hand writing! Love your method of budgeting! One thing I have been doing to help with my meal planning, and by proxy my budget, is using King Soopers (aka Kroger's) click list shopping. Where I work full time it's hard to sit and plan and then go to the grocery store. So I sit with my cookbooks and meal plan and look at the sales and the coupons I have. I add all the things to my list and set a time to pick up my groceries. It's great! I am not sure i get as many deals shopping online as I do in store, but that's ok. I do have to be careful if they substitute out items. If they are out of something, say Hatch Hot Green Chiles (we love mexican food), I can mark whether or not I want them to substitute it if they are out. If I say yes, they try to go with a similar brand/item/flavor and charge the same price. If they have to go to a lesser brand (aka store brand) they don't charge you for the item. If you were ordering the kroger brand, and they went up to a premium brand like Hatch, they would charge you the kroger price. So it works out. It's just hard if there is a specific deal I was wanting and it doesn't work out with the sales. But with all of that said I can get my meal planning and shopping done in 30 minutes! I go to the store, call the number, they bring it out and load it in my car. They double check if the substitutions were ok and I am on my merry way. I don't have to deal with Friday night or Saturday afternoon crowds. It saves my sanity. You get to do it 3 times for free, but after that it's $5. It's money well spent to me. I've been seeing that a lot of stores are doing that now! I had no idea it was only $5--I guess I assumed it would be about $20. I can see how that would be very convenient for someone who works full time! My shopping trip this morning took up the whole morning--between driving to the store, shopping, checking out, loading the car, and then unloading the car and putting everything away. Not to mention the 8 pounds of grapes that I pulled off the stems to put in the freezer ;) It's great that they only charge you the store brand price if you request a brand name item and they're out! Awhile back I thought you mentioned that you took a position with that From Fat to Finish Line group.Is that income just lumped into Jerry's pay for the nearest Friday after you are paid? I actually get paid on the 30th of the month, which made budgeting even more difficult before we started doing it this way. We would usually rely on my check to cover anything that we weren't able to pay throughout the month. Now, instead of budgeting weekly, it's for the entire month. Much easier! 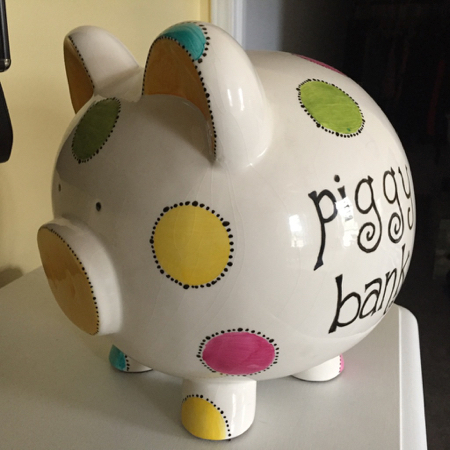 Budgets and debts are so scary -- but it's nice to tackle it as a team (hubby and wife). 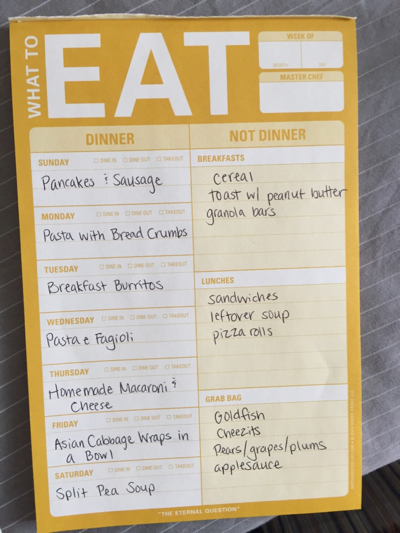 I love the meal planning pad! I'm currently trying my hand at bullet journaling (but without all the artistic touches... just bare bones) -- and I think I could fit a close proximity into my weekly planning pages! I've started doing your budget idea but my date is the 25th of each month. I know there's a grace period, but I like to pay my mortgage by the first each month. I just started on 8/25 so am excited to see where my bank account is on 9/25. Thanks for sharing! Love this post! very exciting for you guys to pay down your debt! The grocery list and the general idea of keeping track is a great way to see where the money goes! Funny how it's the same with calorie counting /weight loss, becoming aware is half the battle!! Do you ever check for the Kroger Free Friday Download? You can just login on Fridays before you go shopping and check for the free download coupon for the week. Then it's just like the rest of the Kroger digital coupons you already have loaded on your card.